The Hawaiian Islands are created by volcanoes. Each island is made up of at least one volcano, many islands are composites of more than one. The Big Island is constructed of 5 major volcanoes: Kilauea, Mauna Loa, Mauna Kea, Hualalai and Kohala. Mauna Loa is the very largest active volcano on Earth. Kilauea is presently one of the most productive volcanoes on Earth (in terms of how much lava it erupts each year). The primary volcanoes on each of the islands are known as a shield volcanoes, which are gently sloping mountains produced from a large number of lava that flows from these volcanoes. The lava produced from the volcano is cooled by the sea water, the cooling of lava results in the rocks called basalt. Hence these islands are made up of basalt rocks. These islands grow by time. Hawaiian volcanoes are primarily erupted by a type of rock known as basalt. When molten,the basalt produces liquids of relatively high fluidity, compared to volcanoes that erupt more silica rich magma types such as andesite, dacite or rhyolite. The fluidity of molten basalt favors the formation of lava flows, which is why the Hawaiian volcanoes generally have gentle sloping sides. By contrast, lavas with higher silica content are more viscous and commonly produce either thicker, shorter lava flows, thick blocky deposits and/or thick beds of ash that fall from the sky following explosive eruptions. These other types of volcanoes (common outside of Hawaii) are typically steeper sided. 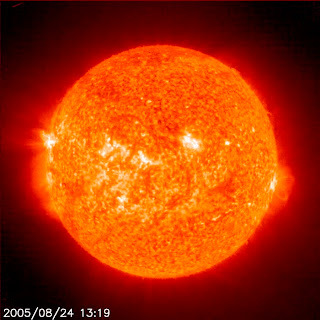 The Hawaiian volcanoes were produced by the Hawaiian hot spot, which is presently under the Big Island of Hawaii. The image below shows the islands of the Hawaiian chain and the intervening shallows, banks and reefs along a line from southeast to northwest. 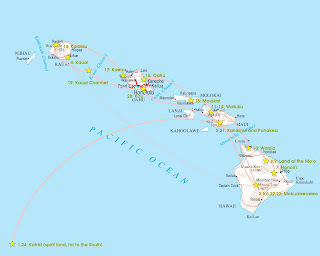 Note that the islands of Lanai and Kahoolawe are not shown because they would "overlap" with Molokai and Maui, respectively (see the map of the Islands on the Hawaiian Volcanoes page) In general, when you move along the island chain from southeast (Hawaii) to northwest, (Kure), the volcanoes become older and older. 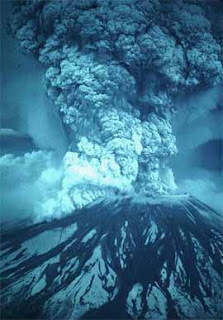 The age trend of the volcanoes is thought to be due to the way in which the islands are built on the moving sea floor of the North Pacific Ocean: the Pacific Ocean is mostly floored by a single tectonic plate (known as the "Pacific Plate") that is moving over the layer in the Earth known as the Asthenosphere. This movement takes it to the northwest compared to the layers below it at a rate of 5 to 10 cm/yr (the rate depends on where you are on it). As the plate moves over a fixed spot deeper in the Earth where magma (molten lava) forms, a new volcano can punch through this plate and create an island. The Hawaiian Islands are believed to be formed from one such 'hot spot'. As the plate moves away, the volcano stops erupting and a new one is formed in its place. With time, the volcanoes keep drifting westward and getting older relative to the one active volcano that is over the hot spot. As they age, the crust upon which they sit cools and subsides. This, combined with erosion of the islands once active volcanism stops, leads to a shrinking of the islands with age and their eventual submergence below the ocean surface. Importantly, the time over which various active volcanoes on the islands remain active is long (hundreds of thousands of years) so that significant overlap in ages occur on neighboring islands. For instance although Haleakala volcano on Maui is a great distance away from the presently erupting Kilauea, Haleakala last erupted only about 200 years ago.